As far as flowers are concerned the pickings are fairly slim in our London garden at this time of year. Because of this I am loath to turf out pots of white Begonia semperflorens which are still plodding along outside the French windows. 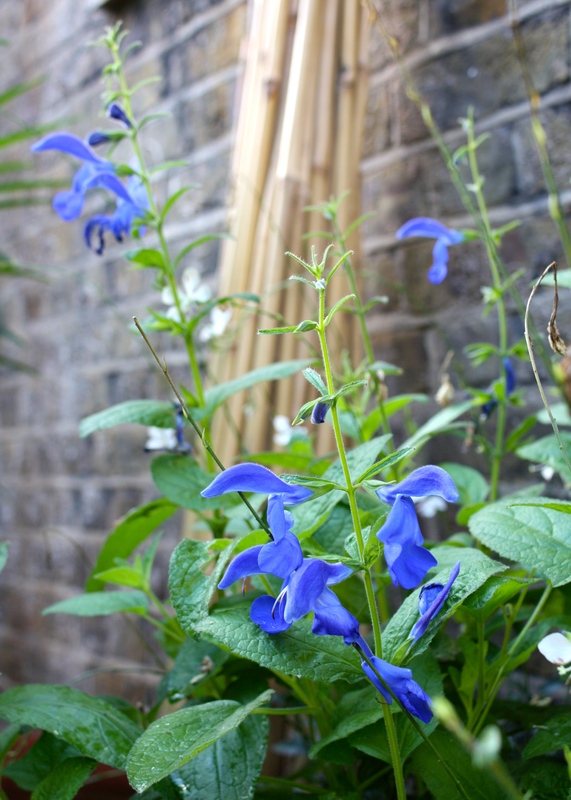 Likewise I am clinging on to Salvia patens, steadfastly sending up new spikes of extraordinary blue flowers despite the cold and wet. And still covered in tiny pink bells is Fuchsia microphylla, its elegant stems arching gracefully over a rough terrain of fallen magnolia leaves. What troupers they all are. One plant that looks better than it ever did during summer is Clematis ‘Madame Julia Correvon’ AGM (top of post). Mme Correvon, a 114 year old Grande Dame of exceptional breeding, is a viticella type clematis, which I always find tragically prone to mildew. Maybe it’s just me, or maybe it’s because every garden I have ever owned has been enclosed, but even with regular fungicide treatment the old lady is covered in a debilitating white bloom by mid-July and rarely recovers her looks until Autumn. From October to December, when damp air is guaranteed, we look forward to a repeat display of her luscious, magenta, windmill-sail flowers. Très Bon. Fairly new to cultivation is Anemone ‘Wild Swan’, a perennial which has quickly achieved star status. It was first spotted by nurserywoman Elizabeth MacGregor growing in a batch of anemone seedlings. That was twelve years ago and by 2011 her discovery had been named Chelsea Plant of the Year. 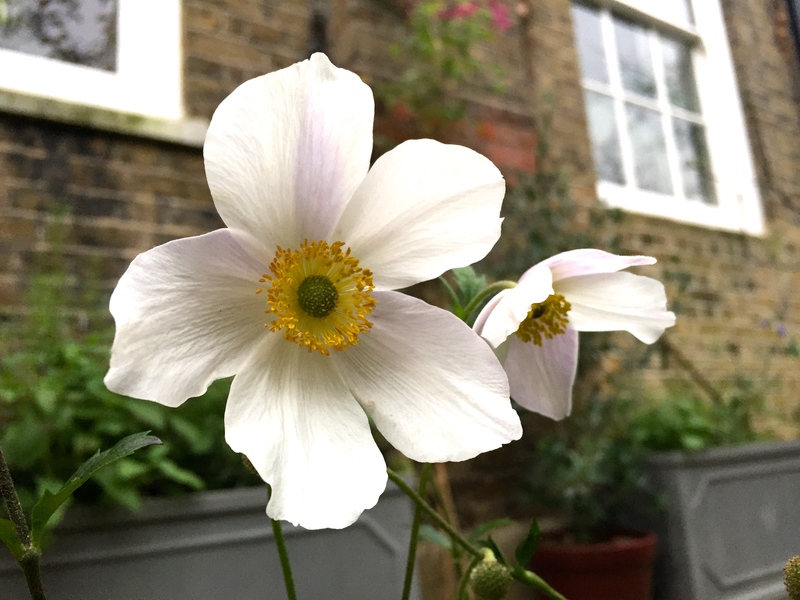 Anemone ‘White Swan’ can still be a little hard to get hold of, but once you’ve tracked it down you’ll be rewarded with elegant white flowers from May until the first frosts. The backs of the anemone’s petals are a moody lilac shade, as if dusted with sultry eyeshadow. I suspect the star qualities of Anemone ‘Wild Swan’ will guarantee its place in plant catalogues for at least as long as Mme Correvon. 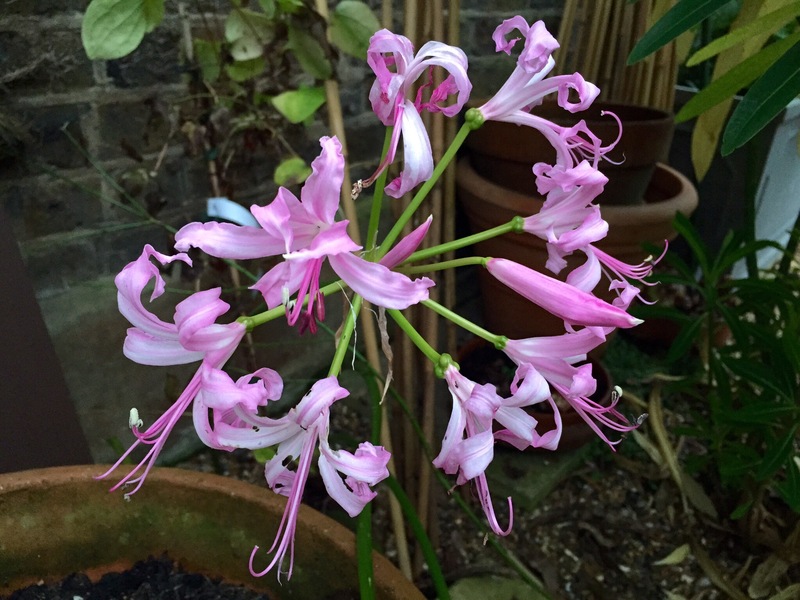 We never have a great deal of success with Nerine bowdenii, mainly because we can’t give the bulbs the baking they need during the summer months. This year has been an exception. New bulbs planted in deep gravel at the foot of a wall have produced tall flower stems topped with explosions of pink. They look completely out of place against the drab detritus of the late-autumn garden, but I find myself thrilled to see them. I hope they’ll be back again next year, bigger, brighter and more plentiful. I’d love to hear what’s still giving you pleasure in your garden and your tricks for brightening up these gloomy days. My roses are doing well at the moment 😊. Here on the west coast of Canada, we have a few things left, I don’t know all the names – hydrangeas, heather, winter pansies -is the best I can do being the farthest thing from a gardener that I am. However, just the prairie provinces next door have nary a thing left for all the snow…so I’m grateful for the colour we DO have. Thanks goodness for the Atlantic, which keeps us both warm (ish)!